She must also deal with the machinations of Kelanim, the mistress of Caisah, who out of fear will do anything to bring Talyn down. Little does the Hunter know that salvation is looking for her, and it wears the face of gentleness and strength. Finn is a teller of tales who carries his own dreadful secret. He sets out to find answers to his path but ends up in the city of Perilous and Fair where he meets Talyn. He knows the danger and yet is drawn to her. Their fates are bound together. Meanwhile, the Hunter's lost brother Byre is searching for his own solution to the terrible curse placed on the Vaerli. He sets forth on a treacherous journey of his own, which will intersect in the most unlikely place with that of Talyn and Finn.The ramifications of this encounter will be felt by all the people in Conhaero, from the lost Vaerli to the Caisah on his throne. Hunter and Fox is a seamless blend of fantasy and adventure that will draw many readers to the Shifted World series. Philippa Ballantine paints a world that is strange and mystical at every turn, setting the stage for what is sure to be an extreme journey for the people of Conhaero. 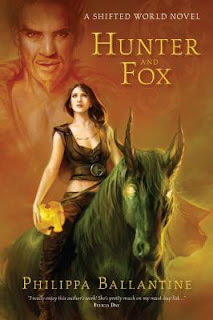 Specifically, Talyn the Dark, her brother Byre, and Finnbarr the Fox who all work to bring back the power of the Vaerli. The Vaerli were a proud people with seven gifts, given through a pact with the powerful and mysterious creatures known as the Kindred. Talyn believes that the cause of all her peoples' troubles is the Caisah to whom she belongs as a bounty hunter. She believes the Caisah will be the answer to her people gaining their gifts back and the ability to unite with one another without certain destruction. Other forces are at work, though, in the Chaos lands, evident to readers as Ballantine focuses on the perspectives of other characters as well. Talyn's brother, Byre, is guided by dreams that lead him to where the history of the Vaerli began. Finn tells tales of the Vaerli hoping to expose the Caisah's injustice while trying to revive the former glory of the Vaerli. It's very intriguing that Finn, Talyn, Byre, and three of Finn's friends known as the Ahouri, have similar goals: bring down the Caisah, restore power to the Vaerli, spread the story of the Vaerli, but they all take different approaches. At first, I didn't like having more than three perspectives that changed with each new chapter. With each new perspective came another side to the story and by the end of the novel it was easier to see that a bigger picture was forming. The Kindred that make themselves known to Talyn tell her that she's not really making the future better for her people and it's too late for her to redeem herself. I'm so used to reading about heroines who always do the right thing and even if they're a little cold they still know how to love and let others in. Talyn was so unlike status quo. She may have been too proud, but she knows the true meaning of commitment and determination. I believe she'll still find a way to help the Vaerli. Hunter and Fox is a grand beginning for the Shifted World series and I can already picture the series gaining more momentum. The next installment, Kindred and Wings, will open the floor for more of Ballantine's complex plot and mind-blowing world!